Beginning at I-8 and U.S. Hwy 95 (in Yuma); easterly on I-8 to exit 87; northerly on the Sentinel-Agua Caliente Rd. to the Hyder Rd. ; northeasterly on Hyder Rd. to 555th Ave.; north on 555th Ave. to Lahman Rd. ; east on Lahman Rd., which becomes Agua Caliente Rd. ; northeasterly on Agua Caliente Rd. to Old Hwy 80; northeasterly on Old Hwy 80 to Arizona Hwy 85; northerly on AZ Hwy 85 to Oglesby Rd. ; north on Oglesby Rd. to I-10; westerly on I-10 to Exit 45; southerly on Vicksburg-Kofa National Wildlife Refuge Rd. to the Refuge boundary; easterly, southerly, westerly, and northerly along the boundary to the Castle Dome Rd. ; southwesterly on the Castle Dome Rd. to U.S. Hwy 95; southerly on U.S. Hwy 95 to I-8. 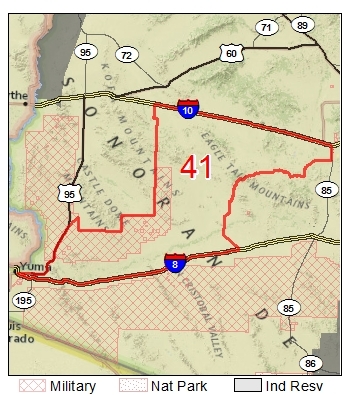 Overview: Currently unit 41 is divided into 41 EAST (Eagletail Mountains and Picacho Hills) and 41 West (Palomas Mountains, Tank Mountains and Little Horn Mountains). Most mountain ranges are surveyed via helicopter every three years. Surveys were last flown in 2012 and are expected this October, 2015. 41W’s last survey suggests the bighorn population is experiencing a declining trend. 41E’s last survey had 59 fewer sheep observed than the 2009 survey; this next survey will hopefully be more encouraging. The three year average score for harvested rams is 161 in 41 East and 155 in 41 West. 41 East: The Eagletail Mountains have long been noted for producing nice rams. Historically a large population of bighorn sheep inhabited the Eagletails. During the late 1960s and early 1970s the population, for no apparent reason, experienced a sharp decline. In the early 1980s the Arizona Game and Fish Department transplanted two groups of bighorn sheep into the Eagletail Mountains in an effort to augment the population. Survey observations in 2012 were below the ten and three year average. Bighorn can be found throughout the Eagletail Mountains. Favorite spots are the Anvil Tank area (in the middle of the range) to the Triple Eye Tank area on the west end of the mountains. Access: Take Interstate 10, I-10, west of Buckeye to the Harquahala Valley exit 81, then south to Courthouse-Centennial Road, then west along Centennial Road to the El Paso natural gas line road. From the gas line road a number of roads will take you to the wilderness boundary. Alternative access: Take I-10 to Hovatter Rd. exit 53, then south of the CAP canal and then southeasterly from the next junction to the El Paso gas line road. From the gas line road travel easterly to roads that lead south to the wilderness boundary. Most of the Eagletail Mountains lie within the Eagletail Mountains Wilderness. Vehicles are prohibited from entering the wilderness area. For more wilderness rules contact BLM Yuma District Office. Picacho Hills: Although the Picacho Hills appear small at first, a good population of bighorn sheep is found there. Bighorn can be found throughout the range. Favorite spots are Picacho Tanks area on the southeast side to Bucket Tank on the northwest end. Access: Take the Harquahala Valley Road south from I-10 to Baseline Road, the west on Baseline to 543rd Avenue/ gas line road then south about 10 miles to the Picacho Hills. Alternative access: You can take the Agua Caliente-Sentinel Road, Exit 87, northerly from Interstate 8, I-8, west of Gila Bend. Take the Agua Caliente-Sentinel Road northerly to the railroad, then north on 571th Ave to the Butterfield Rd., then west for 1 mile, then northerly on 579th Ave / gas line road about 10 miles to the Picacho Hills. Saddle Mountain: Saddle Mountain population is stable, although it is becoming more isolated from surrounding mountains from human encroachment and development. Sheep hunters are encouraged to not overlook scouting this mountain range. Currently there is one AGFD wildlife water on the eastside of the mountain range. 41 West: 2012 survey observations were below the ten and three year average. Palomas Mountains: Occasionally a nice ram can be found here but finding sheep can be difficult. The west end of the Palomas Mountains lie on the Yuma Proving Grounds and access is restricted. Access: Take the Dateland Rd/Ave 64E, Exit 67 (64 miles east of Yuma on I-8) north to the railroad tracks, then west on the dirt road along the south side of the tracks about 1.5 miles. You will notice the Camp Horn, 81st Infantry Division’s memorial pyramid. After crossing the railroad, go north to the last agricultural road then west along an irrigation ditch to the last well. Here a small road leads northerly through a small boulder field directly to the Palomas Mountains about three miles to the north. Tank Mountains: Most of the bighorn are found on the west half of the range from White Tanks to the boundary of the Kofa National Wildlife Refuge. This area lies on the Yuma Proving Grounds and access is restricted and a hunter permit card is required. Access: Take the Exit 67 (64 miles east of Yuma on Interstate 8) north to the railroad tracks, then east along the south side of the tracks about 4 miles and cross railroad tracks. Take this road, BLM YEO25( a.k.a. Palomas-Harquahala Road), north about 8 miles and westerly 9.5 miles to the east end or north 5 miles and westerly 15.5 miles to south end of the Tank Mountains. See the Government Agency list below to contact Yuma Proving Ground, YPG, to arrange access into the East Arm which includes a portion of Tank Mountains. Cell coverage is usually available at the YPG boundaries’ access points to call for clearance. Little Horn Mountains and Clanton Hills: The Little Horn Mountains are located about 12 miles directly north of the Tank Mountains. The Little Horns are comprised of a large mesa complex. Most of the bighorn are found on top of this mesa which makes it very hard to see bighorn without having to climb to the top. Further complicating the matter is a series of deep canyons that transect the top of the mesa. These canyons provide good forage and bedding areas for bighorn. Occasionally bighorn can been found on the low hills immediately just north of the main mountain mass. Sheep can also be found in the low hills just west of the Hovatter Road along the Kofa National Wildlife Refuge boundary, especially in the Sheep Tank Mine area. Access: Take the Exit 67 (64 miles east of Yuma on Interstate 8) north to the railroad tracks, then east along the south side of the tracks about 4 miles and cross railroad tracks. Take this road, BLM YEO25/ Palomas-Harquahala Road, north about 10 miles to the Clanton Hills. Immediately east of the Clanton Hills you’ll find the Palomas-Harquahala Road continues that subdivides unit 41 east and west. At the junction of BLM YE006 road go westerly to access the Little Horns Mountains range. Alternatively, you can also access the Little Horns by taking the Hovatter Road, Exit 53, southwesterly and southerly from I-10 into the Little Horns. North Gila Mountains (north of I-8): Most sheep are found on the southern half, although occasionally sheep have been known to cross I-8, near milepost 19. Access: From S.R. 95 travel north of Yuma to the south side of the Wellton-Mohawk Canal and travel easterly to numerous access roads. Alternative access: From S.R. 95 travel easterly to Blaisdell and turn southerly on to Rifle Range Road to access the west half of mountain. Muggins Mountains: Through a summer long effort of photo trapping, sheep have been seen throughout the range open to access. It would be highly encouraged for future bighorn hunters to spend time scouting. YPG has opened areas south of the 500 KV power line road that transects the mountain range east and west. Access: From Dome Valley traveling easterly on County 4th St., you will meander easterly along the power line road leading into the center of the Muggins Mountains. In addition, take County 7th St. easterly and follow the BLM signs leading to the Muggins Wilderness Boundary. Alternative access: Take the Wellton, Exit 30, north to County 10th St. then west to Ave 27 E then north to the BLM 4253 road, a.k.a. as the Palomas Road. From the Palomas Road, travel east to find large dry washes leading north to the 500KV power line. In addition, travel west to find large dry washes leading north to the Muggins Mountain Wilderness boundary. Overview: With mule deer densities at about 1 deer per square mile. . Most of the deer are found in desert riparian areas (washes) that are heavily vegetated. However, hunters can make use of low lying hills throughout the Palomas Plains to glass from. The best way to hunt these “flat-landers” is to hunt in pairs and glass the flats from hill tops. When a deer is spotted one person can remain on high ground and guide his partner to the deer. Deer are also found along the Gila River just north of Interstate 8. These deer are very difficult to find because of the dense vegetation and low numbers, but the rewards can be great for some very large mule deer bucks can be found here. The people that have the most success taking deer in the dry Gila River area do it by finding active game trails and setting up a blind. During dry years many deer may be found in and around the agriculture areas of Harquahala Valley, Hyder Valley, and the Wellton-Mohawk Valley. Deer typically feed or water at night in these areas, then return to the adjacent desert during the daytime. Sometimes deer can be found in the fields just before dark or at sunrise. When hunting the agriculture areas be sure to observe all safety rules and watch for farm workers and equipment. Many of these areas are posted private land. Be sure to check the land status before hunting these areas. Numerous Arizona Game and Fish Department water catchments are found throughout the unit. No camping is permitted within 1/4 mile of these waters. A person shall not place any substance, device, or object in, on, or by any water source to prevent wildlife from using that water source. Report any problems with catchments to the Arizona Game and Fish Department Region IV Headquarters, Yuma at (928) 342-0091 or criminal violations to the Operation Game Thief line at (800)352-0700. Palomas Plains: Although mule deer are found throughout the unit, most of the deer are found in the Palomas Plains area north of Dateland. The Palomas Plains are very flat and are bisected by large desert riparian areas. Access: To reach the Palomas Plains from the north (Interstate 10) take the Hovatter Road or Harquahala Valley Road straight south into the north part of the unit. From the south, take the Agua Caliente-Sentinel Road through Hyder or the Dateland/ Ave64E Road north to the Palomas-Hyder Road. Travel east about 4 miles and cross the railroad to BLM YE025/ Palomas-Harquahala Road, this road will take you to the heart of the Palomas Plains and the best mule deer hunting. Wellton-Mohawk Valley: Typically, the deer feed and or water at night in the fields, then spend the days in the desert areas just north of the agriculture area. Please take note of any private land and be careful not to shoot near buildings. To reach this area take exits 30, 37, 42 and 54 off Interstate 8 east of Yuma. Hyder Valley: During dry years deer can be found around the agriculture areas in the Hyder Valley. Please take note of any private posted lands and don’t shoot near buildings. To reach the Hyder area, take the Agua Caliente-Sentinel Road north from Interstate 8, exit 87, and west of Gila Bend. Harquahala Valley: During dry years deer can be found around the agriculture areas in Harquahala Valley. Please take note not to enter posted private land and don’t shoot near buildings. To reach this area, take the Harquahala Valley Road south off of Interstate 10, Exit 81, and west of Buckeye. Eagletail Mountains: The Eagletail Mountains, located just southwest of Harquahala Valley, is the only mountain range in Unit 41 that contains significant numbers of deer. Almost all of the Eagletail Mountains lie within the Eagletail Mountain Wilderness Area allowing for a hunt away from the majority of other hunters. This is an excellent opportunity for a pack in hunt via backpack or horse. Become familiar with BLM wilderness rules, you’re encouraged seek clarification from the BLM Yuma District Office. Access: Take the Harquahala Road south from Interstate 10, Exit 81, and west of Buckeye. Travel south to Courthouse-Centennial Road, then west to the gas line road, then west along this road. There are several roads leading to the edge of the wilderness from this road. OHV Use: Most of Unit 41 mule deer inhabit large flat areas that can be negotiated by various types of OHV vehicles. Most of the land in Unit 41 is under the administration of the BLM. Vehicles are restricted to existing roads, trails and large desert washes on BLM land. Cross country travel is not permitted under any circumstance. Operators of OHV’s are also responsible for damage to native plants. These regulations are enforced by both the Arizona Game and Fish Department and BLM Rangers. There is a small amount of state land scattered throughout the unit. OHV use on state land is restricted to existing trails and roads; however, a vehicle may be used to retrieve a downed and legally taken big game animal on or off road. Operators of OHV’s retrieving downed big game are still responsible for damage to native plants. ATV, UTV, and rails designed by the manufacturer primarily for travel over unimproved roads and having an unladen weight of 1800 lbs or less requires an OHV decal to operate on public and state trust lands. OHV decals are available online at www.servicearizona.com and at MVD offices statewide. Overview: Unit 41 is an excellent dove hunting area, specifically, the Wellton Mohawk and Hyder valleys. Due to habitat loss and changes in crop patterns the dove hunting has been greatly reduced, but remains good to very good in localized areas. This coming season several cooperative efforts with local farmers has secured farm fields growing seed plant throughout the first open dove season. When you find these areas, I would recommend you scout out flyways to avoid the cluster of hunters around or near the farm fields. Areas: Wellton Mohawk Valley: During the 1970’s the Wellton Mohawk Irrigation and Drainage District had tremendous populations of mourning and whitewing dove populations. Most of the wheat and maize fields that hunters traditionally hunted in the Wellton Mohawk Irrigation and Drainage District are now planted in vegetables by August. Good shooting can also be found in some spots along the Gila River that runs through the middle of the valley. Some good flights of doves can be found around the edge of the desert as doves fly from their desert roost into the valley to feed. Access: Take Interstate 8 east of Yuma then exit at any of the following exits: exits 20, 30, 37, 42 and 54 north into the valley. Hyder Valley: Due to reduction of farming activities in the Hyder area, this area no longer provides the fine dove hunting that it once did. Good localized flights can still be found around the few remaining fields. Access: West of Gila Bend on Interstate 8, Exit 87, take the Agua Caliente- Sentinel Road north about 12 miles to the Hyder valley. Private Property: Much of the dove hunting in Unit 41 takes place on or near private property. Many farms post their land during the dove hunt. Please take notice of these postings. Before hunting on non-posted land try to find the owner and get permission. Do not enter fields where there are standing crops. The Whitewing Ranch and Red Mountain Farms are closed to hunting. Other: Do not clean birds in the canals or on roadsides. Bury all remaining carcasses and feathers. Pick up all litter and empty shell cases. Please note that empty shot shell casings are considered littering. See the Government Agency list below to contact Yuma Proving Ground, YPG, to arrange access into the East Arm which is open to hunting and camping. Eurasian collared doves hunting opportunities are increasing around agricultural areas and surrounding wild lands. Overview: The 2015 hunt is expected to be a good one. With the above average moisture received this year the desert will provide plenty of forage for the quail. Hatches are predicted to be above average this year. Areas: The Palomas Plains area north of Dateland has numerous large desert riparian areas that provide good quail habitat. Access: About 64 miles east of Yuma on Interstate 8, Exit 67, take the Dateland/Ave 64E Road north to the railroad tracks and then 4 miles east to BLM YE025/ Palomas-Harquahala Road north into the desert area. Vehicles are restricted to existing roads, trails and desert washes. Wellton-Mohawk Valley and Gila River area: Birds along the Gila River are very difficult to hunt because of the dense brush. Please take notice of private land and posting and don’t enter fields where standing crops are growing. Access: Travel east of Yuma on Interstate 8, take exits 20, 30, 37, 42 and 54 north to the valley and the Gila River area. Hyder Valley and Gila River Area: Fair numbers of birds can be found around the agriculture areas of the Hyder valley and the Gila River area north of Sentinel. Please take notice of private land and posting. Access: From Sentinel on Interstate 8, Exit 87and west Gila Bend, take the Agua Caliente- Sentinel Road north to the Gila River and then further north to Hyder. Harquahala Valley: Fair numbers of birds can be found around the agriculture areas and the adjacent desert areas of the valley. Please take notice of private land and posting. Access: West of Buckeye on Interstate 10, Exit 81, take the Harquahala Valley road south to the valley. Overview: There is no open season for antelope. It is a great privilege to see Sonoran pronghorn antelope roaming its historical ranges. In part of an enormous effort from many governmental agencies and non-governmental organizations, these antelope have been reintroduced to areas they had been extirpated from for many decades. Most of this area is extremely remote and waterless, so planning is very important when making a trip into the heart of Unit 41. It is encouraged to leave a written itinerary with family and friends. Most open BLM roads are numbered and mark, the BLM Little Horn map correlates best for this area. From the East: Agua Caliente-Arlington Rd. Camping is allowed on BLM-administered public lands throughout the unit. Most of the unit is flat desert land and dissected with many vegetated washes. The unit encompasses several very rough and barren mountain ranges, the Eagletail, Little Horn, Tank, and Palomas mountains. Elevation ranges from just 400′ on the desert plain to nearly 3,000′ on some of the higher peaks. The flats are sparsely vegetated with creosote, ironwood, paloverde, and saguaro cactus; the mountains with creosote and paloverde. Applicants are encouraged to wait till new YPG Visitor Center is opened in July. It is prohibited to transport a loaded firearm in a vehicle on YPG. The District prohibits open campfires. Trapping is prohibited west of Ave 22E along the District’s floodway and Gila River holdings.